peff.com » Cassette Recorder Audio Processor Rack Extension - Number 2! Cassette Recorder Audio Processor Rack Extension - Number 2! The Cassette Recorder Audio Processor Rack Extension is back and better than before! This time we bring you the more Pro Version with L0-f1 Dolphonics™ Processing! We listened to everyone who loved the classic tape sound of the original C.R.A.P.Re, and added more controls for even worser tones. It’s guaranteed to make things sound warm and fuzzy and buzzy and hummy and munchy. It’s like the Original Crapre, but with more Number Two! CRAPRE’s Cassette Tape Mutilation technology is the result of decades of research by the brainy dudes at Sonic Charge who are secretly hoarders of cassette recording devices. Every weekend, they scour the landfills of Europe, looking for discarded decks. They then pop in mix tapes they made for girlfriends in the 80s and analyze the beauty and wonder of all that is cassette tape! Because we wanted to make this more Pro Version, we hired the finest Scandinavian jewelers to craft the 3.38 karat jewel ‘ncrusty gold knob that controls the Output level! To keep the vintage sound, we recycled the worst, most crappy, used potentiometers from old car cassette decks that scratch and hiss when turned. We also upped the gold on the Wetter knob control. It’s like a “Rose-ish” pink and gold. You can turn it and it will make things dry, but Wetter is Better! The pink and gold Pheedback knob is the heart of the new Dolphonics™ technology. Twist it a little and you will hear the pleasing sound of sea creatures in the tropics. Turn it all the way for the maximum Dolphonic overload. While some technology maxes at the “10″ setting, Pheedback only goes to 9… THOUSAND! Dolphy NR is nothing special. It just filters noise and makes you think you’re listening to less crap while filtering out crap that you don’t think you want to listen to. Flip it off for maximum cassette bandwidth, or flip it on to filter off the crappy goodness that is tape! Convolution Reverbs are nice and all that, but SPRING REVERB is the sh\crap! 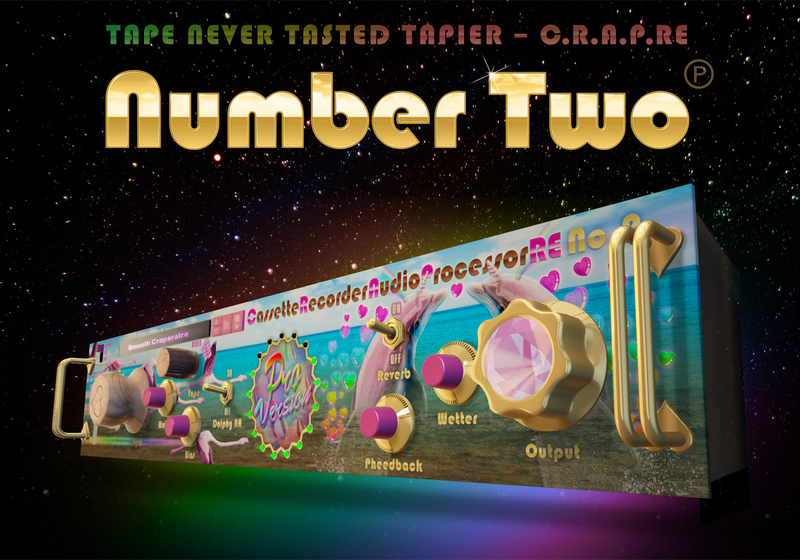 We kept the super analoggy spring reverbivation system in Crapre Number Two. Flip the switch for some springy dingy ding action! Bias controls this weird thing with the tape saturation magnetic flux capacitor thingy that makes things sound more distorted and crappy. Keep it at zero for plain dull crap, or turn the control up or down for more even more crappiness! The Wobble knob is the new magic feature of C\2! You set the tape for steady playback or increase the probability that your tape will get munched! The Input knob controls the hyper input drive gainer circuit stuff. It’s the same transistor melting technology that will overdrive your tape into submission, but this is the magic of the classic CRAPRE tone! We were pretty much broke after spending all that cash on gold knobs, so we resorted to making our own wood knob heads for the Input control. Each knob is a personalized work of art, individually crafted and decorated, a true labor of love, and perfectly balances out the ostentatious gaudiness of the control panel. The Tape Quality Switch selects between Bad Quality Tape, Bader Quality Tape which is worser than Bad Quality, and our patented Super CRAP setting that has the sound of a special chromium dioxide and high fructose unicornium tape formulation. It’s super crappy! Voltage selector allows you to set a lovely ground hum noise caused by 40-year-old leaky capacitors oozing cap-juice all over the power stuff inside. Choose from an old school 220 Volt 50 Hz mains voltage, 110 Volt 60Hz electricle outlet, or the DSea Battery. Please do not attempt to repair this yourself.